When the first 5.0-liter V-8 Ford Mustang appeared in 1979, many let out a sigh of relief. No matter what engine Ford crammed into the Mustang II, it was still Pinto-based and muscle car cues made it look like a five-foot tall weightlifter. Built on the Fairmont platform, the new angular “Fox” body was no beauty queen but it finally gave the Mustang some performance cred again. It would endure until 1993. 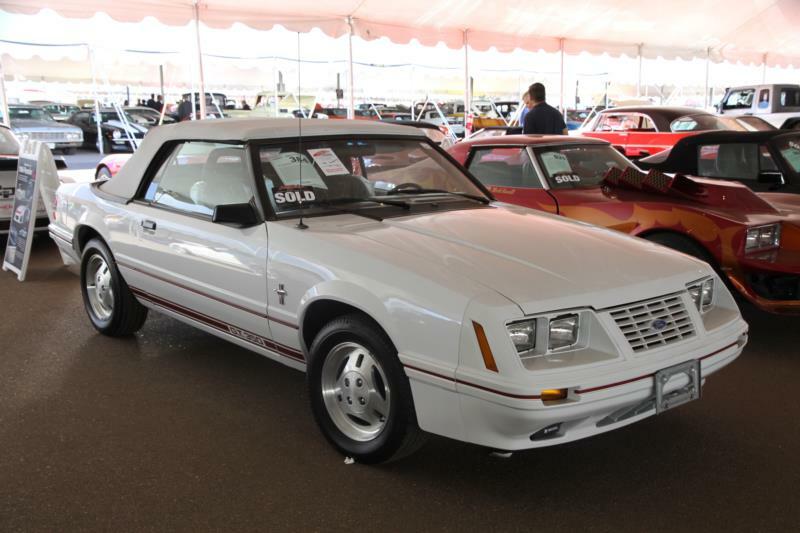 Ford offered the Fox body Mustang in coupe or three-door hatchback versions, with 20 percent more interior space than the previous car and a much more aerodynamic shape than the previous model. A Mustang hatchback was chosen as the pace car for the 1979 Indy 500, and though the wild horse graphics overstated the 302’s modest 140 bhp, about 6000 replicas were sold. An 88 bhp 2.3-liter four-cylinder addressed gas mileage concerns, while a turbo four produced 140 bhp. Ford also offered European TRX metric-size wheels with Michelin tires, which confused tire companies and owners alike. 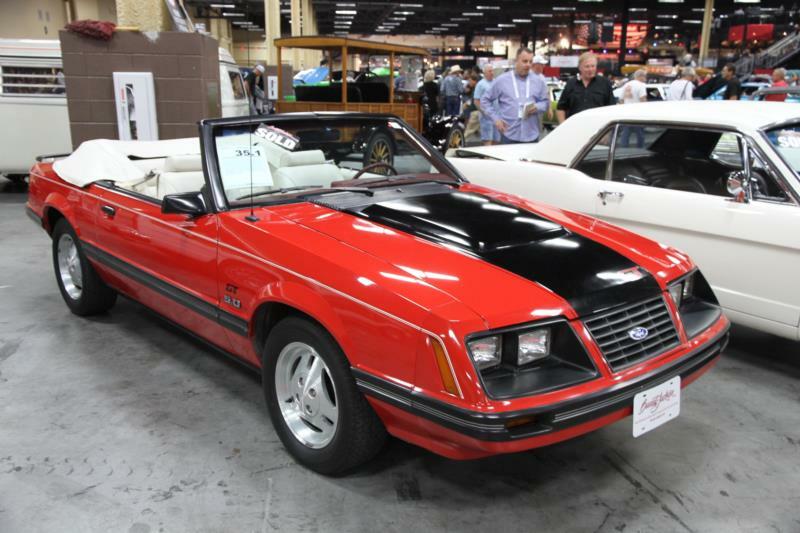 The V-8 had been reduced to 255 cubic inches in 1980, but Ford re-introduced the 302 V-8 as the 5.0-liter Mustang in 1982, adding a convertible a year later. The company persisted with a turbo program, too, and an SVO Turbo was launched in 1984 to celebrate 20 years of the Mustang. It cost thousands more than the V-8 Mustang, but the 2.3-liter four-cylinder boasted 175 bhp, and was backed by a 5-speed gearbox, tuned suspension with a limited-slip axle, and four-wheel disc brakes. With a ram-air intake, the SVO could do 0-60 mph in 7.5 seconds and hit a top speed of 134 mph. It was only available as a three-door hatchback, and had an interesting biplane rear spoiler arrangement. The V-8 received an upgrade in 1985 when the 5.0-liter Mustang GT offered an HO engine with four-barrel carburetor, roller cams and 210 bhp for $9,885. Sales of V-8s jumped from 36,038 in 1984 to 45,463 in 1985. That same year the SVO received an intercooled turbo which boosted power to 205 bhp and a new front fascia, with flush-mounted headlights. The 5.0-liter Mustang GT received multi-port fuel injection for 1986, though power dropped slightly to 200 bhp. A 5-speed manual gearbox was standard with an overdrive automatic transmission optional, and the model was available as a hatchback or convertible. This would be the last year for the SVO turbo and a total of 9,844 were built. For 1987 the SVO nose with its flush-mounted headlights was standardized across the range. A new dash was accompanied by major revision of the body with air scoops, rocker panel moldings and front and rear spoilers. The GT’s 5.0-liter V-8 now produced 225 bhp and would continue to the end of the model run in 1993. The IROC Camaro and Pontiac Firebird, however, were generating 275 bhp from their 350 cid V-8s, and Ford made plans to compete with them. The answer was the 1993 Ford Mustang Cobra, from the new SVT division. Ford GT40 heads were used on the 5.0-liter V-8, with larger valves, stronger springs, high-lift cam, bigger injectors and free-flowing exhaust. Four-wheel disc brakes were fitted, and the gearbox was beefed up. The result was 0-60 mph in 6.2 seconds, against 5.6 seconds for the IROC Camaro. The Camaro was also slightly quicker through the quarter mile at 14 seconds against 14.4. Ford countered with the Cobra R, essentially a street legal racing version. It was a lightweight, with wind-up windows, no radio, no air conditioning, basic front bucket seats and no rear seat. It had a stiffened floor pan, Koni double shocks, larger radiator, and oil and power steering coolers. Only 107 Cobra R’s were built, and cost $25,692, against 4,993 Cobras, which sold for $18,555. The Fox body Mustang has long had a certain appeal to many enthusiasts for one simple reason: it’s a sleeper. Other than some of the later GTs with their spoilers and side skirts, and aside from small “5.0” badges, Fox bodies look like bland two-door commuter cars that most people would never guess had a big V-8. It’s something that few cars in the flashy 1980s and 1990s were able to pull off.